KATHMANDU, May 3: The Oli government has quietly given permission to Kathmandu-based Indian embassy to continue with its controversial Small Grants Projects across Nepal. This comes despite a provision in the National Integrity Policy that proposes to bar all foreign countries, diplomatic missions and international non-governmental organizations from directly funding projects in Nepal. The extension of the highly-controversial Small Grants Agreement (SGA) for the next three years allows the Indian embassy to directly fund projects of up to Rs 50 million in any part of the country purely at its own discretion. The then Sher Bahadur Deuba government had decided not to extend SGA, citing constitutional difficulties, as the scheme had created a huge controversy within Nepal. “A decision has been taken to extend the term of the Small Grants Agreement for an additional three years. The term extension process is over. But work is currently underway to finalize the procedures,” said Joint Secretary Kewal Prasad Bhandari, who heads the International Economic Cooperation Coordination Division at the Ministry of Finance. Bhandari said they are currently holding discussions on how to endorse such requests from the Nepal side and how to take the money received under the agreement to the project sites. With the renewal of SGA, the Indian embassy will again be allowed to invest up to Rs 50 million on any project on its own. The agreement had expired on August 5, 2017. The Deuba government had decided not to extend SGA, saying the country had now embraced federalism. Although there have been protests against the implementation of projects of this nature by the Indians, all past governments had been extending the term under pressure from various quarters. Sources at the Office of the Prime Minister and Council of Ministers said the Nepal government decided to extend the term after the Indian side agreed to bring the amount to be spent for Small Grants Projects within Nepal’s national budgetary system. However, it is pointed out that it is still the Indian embassy that determines almost everything about such projects. “Earlier, the money [for such projects] did not come under the budget. The embassy would directly select and fund the projects at the local level. Although the money now comes under the budget, it is still the embassy that calls all the shots. The Indian embassy has been allowed to continue with SGP at local level in an indirect way,” said a source. 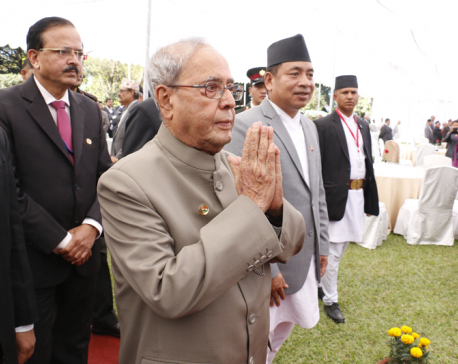 Then prime minister the late Surya Bahadur Thapa had first allowed the Indian embassy to select and fund projects on its own at local level in any part of the country. This was back in 2003. Although the embassy was initially allowed to fund projects of up to Rs 30 million only, then prime minister Baburam Bhattarai increased the ceiling to Rs 50 million. The Indian embassy had lobbied hard to continue with the agreement when its term expired in August. The Deuba government had declined to oblige. The Oli government is extending SGA ahead of Indian Prime Minister Narendra Modi’s coming visit to Nepal. According to sources, the Oli government has extended the term in line with Article 51 (E) 11 of the Constitution. The article states that foreign aid shall be received in line with national needs and priorities and that it shall be transparent. The same article also states that the amount received under foreign aid shall be included in the national budgetary system.